DC:Gary, so far so good, the fuel injection has been so good during running in (that’s up to 6000rpm remember) that it hasn’t been an issue. CB1300S owner David Gibson said: “I’ve had my CB1300S two weeks old and completed 1200 miles. I am still delighted with the bike. Great for two up riding, and comfortable for long distances. DC says: Now that you point it out, I am noticing this. But only if I’m looking at the screen itself. With earplugs in it doesn’t intrude and the bike certainly doesn’t feel vibey. The mirrors aren’t badly affected either. I had a similar problem on a previous bike (a ZZ-R1200) and found a bit of BluTac in the relevant places did the trick. Peter Taylor emailed to say he’d had a couple of warranty issues: “My stand is being replaced due to paint flaking and my mirror mount bolts are going rusty too. Little gripes and the warranty is sorting.” Pete is 6ft 2in and says windblast IS an issue for him. We’ll let you know when we get our hands on a taller or flip-up screen. Make your Honda CB1300S comments or put your questions direct to David on the CB1300S’s dedicated forum on motorcyclenews.com. Go to motorcyclenews.com/haveyoursay then select ‘bikes’ and you’ll find the CB1300S’s forum listed with the rest of the Hondas. My CB1300S was one of MCN’s later arrivals, so I’m still in the process of easing towards its first service at 600 miles. I’ve actually hit around 450 miles. Running in on this bike is a simple matter of not going beyond 6000rpm and avoiding allowing it to labour in high gear. Which leaves plenty of time to daydream about where we go from the first service. Bolt-ons, ride-outs and meetings are all on the agenda. I’ve now got hold of some official Honda accessories – crash bungs (£135) and a rear carrier (£225). I've also got a bellypan from Ermax - and I'm planning a higher or flip-up screen from them too. 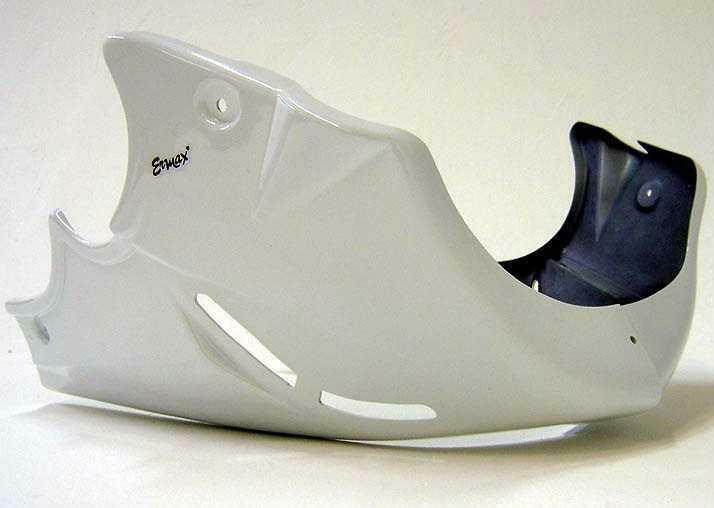 Ermax say the bellypan they designed for the CB1300 will fit the CB1300S and it comes in at just under £150. It arrived with us this week so I’ll soon be attempting to bolt it on and be able to let you know exactly how well it does fit. Prices for a higher or flip-up screen have yet to be set. Some taller riders have complained that windblast is an issue for them – even with the half-faired S version of the CB1300. At 5ft 10in it’s not a big issue for me, but a flip-up screen may make distance work a tad easier. I’ll be trying one when they become available. I’ve mentioned before that a centrestand would come in handy. Funnily enough, Honda does one (£140) – and a paddock stand (£60). I already have a paddock stand, but the CB can be a bit of a hefty brute to raise on to it single-handed. A few wheel washes and chain-adjustments down the line may have me resorting to the centrestand. I’m still knocked out by the look of the CB every time I roll up the garage door. I’m looking forward to getting a number of them together for a ride-out and meet in the next month or so. If you have a CB1300S and want to join in either email me, david.Cushman@emap.com or keep checking the CB1300S forum in the Have Your Say/Bikes section of motorcyclenews.com. See link, right, for a video walk-round of our bike PLUS links to Honda's official CB1300S web pages.